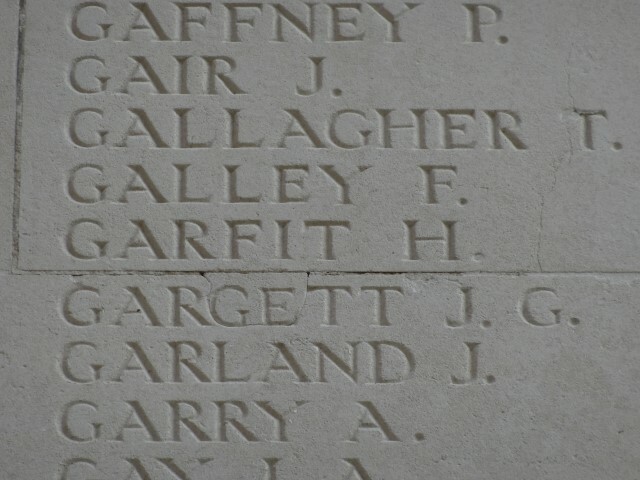 30569 Private J.G. 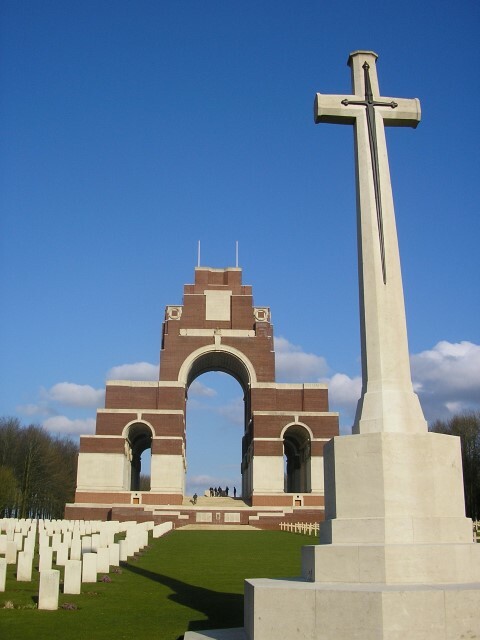 Gargett, 2nd Battalion, the Durham Light Infantry was killed in action 16 September 1916 and is commemorated on the Thiepval Memorial. 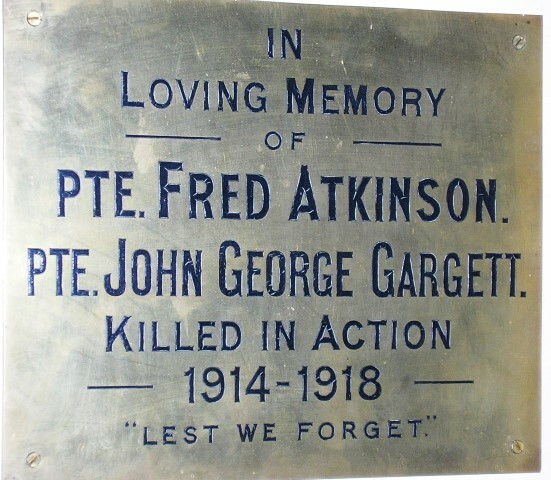 He was 26 years old and is commemorated on the Butterknowle War Memorial, the memorial plaques in St. John the Evagenlist Church, Lynesack and the Village Hall, Butterknowle, previously in the Methodist Chapel, Butterknowle. In 1891, the family lived at Quarry Lane and James worked as a coal miner. By 1901, the family lived at Copley Lane. James was a coal miner (hewer). By 1911, the family was still at Copley Lane. James was still working as a coal miner (hewer), 20 year old John George was employed as a bricklayer and 19 year old Thomas William was a coal miner (putter). In 1915, aged 25 years 6 months John George Gargett enlisted at Bishop Auckland into the 3rd Battalion, the Durham Light Infantry being given the regimental number 30569. This was a Reserve Battalion stationed at South Shields as part of the Tyne Garrison, a depot/training unit. He underwent a medical examination was considered fit for general service. He was 5ft 3½” tall and weighed 130 lbs. His religion was Church of England. Between 24 May 1916 and 16 September 1916, the 6th Division as part of the XXIV Corps, Fourth Army saw action in one major offensive, the Battle of Flers-Courcelette 15-22 September 1916, a phase of the Battle of the Somme. 12 September: marched to the Citadel near Fricourt, draft of 16 men arrived, officers taken to reconnoitre the trenches which the battalion was to occupy south of Trones Wood. 13 September: 2/DLI moved 2 companies into a position known as the Triangle. The mission was to bomb down Straight Trench which would lead into the Quadrilateral. The battalion moved up from Trones Wood to the Guillemont-Wedgewood trench and from there to the Triangle. 16 September: morning, a further advance was made. Heavy machine- gun fire held up the attack. Casualties had been heavy on the night of the 15 September – Captain B. Baty and Second Lieutenant R. Meikle killed and 5 other officers were wounded. During the morning attack, Second Lieutenant L. Birtles was killed and 2 officers wounded. Later in the day, Capt. 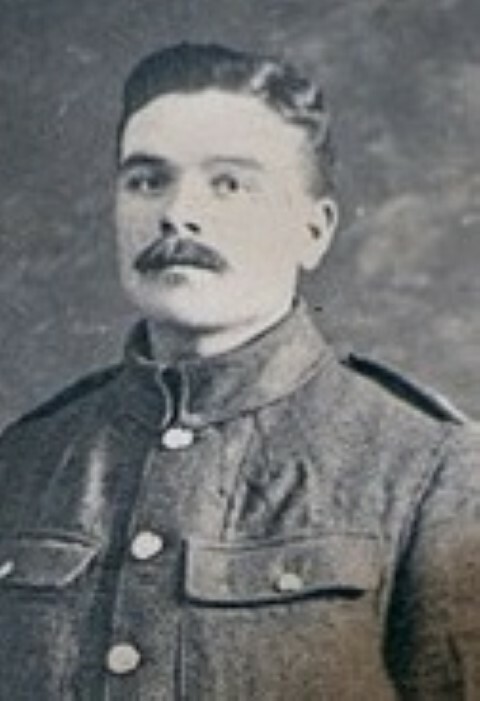 E. Hughes died of wounds. Among the men, 30 had been killed, 99 wounded and 34 were missing. That night a battalion of the West Yorkshire Regiment relieved 2/DLI. The battalion moved back to Trones Wood. Later research records that between 13 and 19 September, 2/DLI lost 2 officers and 40 other ranks killed in action or died of wounds, 2 officers (Birtles and Hughes) and 38 other ranks on 16 September including 30569 Private J.G. Gargett. “They [14/DLI] were in reserve with the rest of the 18th Brigade and did not come into action on September 15th when the division made a hurried and unsuccessful attack on the Quadrilateral, a German work about 1000 yards east of Ginchy. Private J.G. 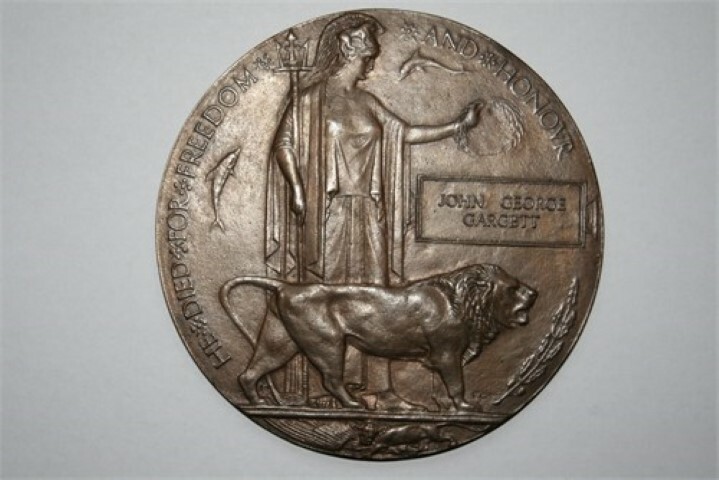 Gargett was awarded the British War and Victory medals. 1891, 1901, 1911 census records & ancestry family tree Note: Lily bc.1897 died in infancy? Army Form B.178; Note: The Descriptive Report on Enlistment records that he was 5ft.4¾” tall.